New Glasgow-based five-piece Ímar stand out from the crowd – by taking things back to basics. 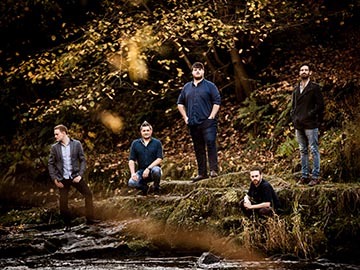 With a line-up featuring members of Mànran, RURA, Talisk and Barrule, and a heavyweight collective haul of top prizes – including a BBC Radio 2 Young Folk Award, nine All-Ireland and eight All-Britain titles – the group’s formation embodies a personal reconnection with its members’ formative years, dating back long before their recent camaraderie around Glasgow’s justly celebrated session scene. The band’s unmistakable synergy centers on the overlapping cultural heritage between Scotland, Ireland and the Isle of Man. All three places once shared the same Gaelic language and a similar kinship endures between their musical traditions. While Ímar’s output so far comprises just two newly-released singles, they have been in the studio during 2016 to record their debut album, which will be launched in early 2017, promoted by extensive touring.